Photograph inscribed as follows: To Major J.S. Matthews V.D. City Archivist - Vancouver BC with best wishes fron Douglas Fisher Captain RN H.M.S. 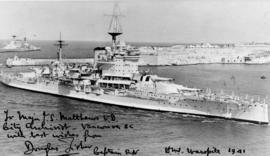 Warspite 1941. Photograph also shows the HMS Hood in the background.